This tour was such a great way to see this beautiful city and learn about it's proud history. The tour guide was knowledgeable and enthusiastic to share information about the city he so clearly loved! I thought this tour was okay. We did a tour in Washington DC that was way more interactive. We only got off the trolley once to take pictures, which was kind of a bummer. There was a lot of time spent talking about the University, which I wasn’t too fond of. Overall, the tour was good. I wish we would of been able to get off more, but the guide was very informative and had really fun trivia about Richmond! Covered a lot of Richmond. Emily was our tour guide, Robert was out driver. Wish we could have gotten out at a few more places. Driving down monument circle couldnt see the statues, only saw base of statues. We only had a few hours to see the sites of Richmond. 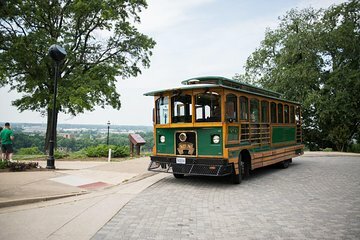 The Trolley was a great way to see a lot of sites and hear some history in a short time. Highly recommend. the tour was really a nice experience. The negatives: the trolley was really rough riding and noisy. At one traffic light a moped was directly behind us and drowned out the narrator. I guess that if the AC was on and the doors were closed it would have been better. Very entertaining ride. The tour guides were great, very knowledgeable and we got a great feel for the city. The tour and information was interesting, but why city tours insist on using 80 year old trolleys is a mystery. The trolley is noisy, the tour guide speaks through an amplifier with a single speaker that is too loud for some and not loud enough for others, the seats are hard and small and lack legroom for people of the 21st century and the windows are not made for seeing the sights. Thankfully it was air conditioned. This was a sister's weekend getaway and we were looking for convenience. The Trolley Tour pickup and drop-off were right down the street from our hotel! And the tour itself was so enlightening. I am a history buff, but I learned so much more about Richmond......and I thought I was a semi expert having spent so much time there over the years. We plan to do it again with my granddaughter. Fantastic guide, wonderful city, very conscious of its rich history. Enjoyed it tremendously.